7th CPC: Cabinet Approval on Fixed Medical Allowance & Constant Attendance Allowance 10. 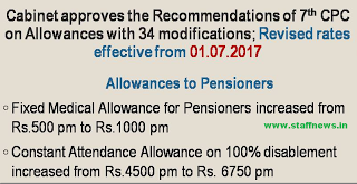 Recommendations in respect of some important allowances paid to Pensioners Rate of Fixed Medical Allowance (FMA) for Pensioners has been increased from ₹500 per month to ₹1000 per month. This will benefit more than 5 lakh central government pensioners not availing CGHS facilities.